Dmitri Mendeleev was passionate about chemistry. His deepest wish was to find a better way of organizing the subject. Mendeleev’s wish led to his discovery of the periodic law and his creation of the periodic table – one of the most iconic symbols in science: almost everyone recognizes it instantly: science has few other creations as well-known as the periodic table. 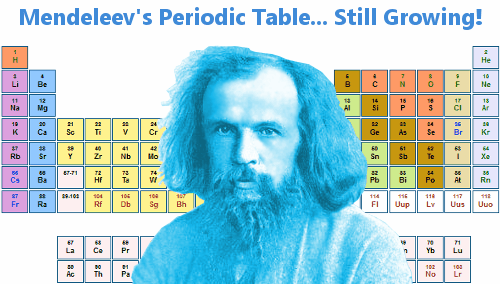 Using his periodic table, Mendeleev predicted the existence and properties of new chemical elements. When these elements were discovered, his place in the history of science was assured. Dmitri Ivanovich Mendeleev was born on February 8, 1834 in Verkhnie Aremzyani, in the Russian province of Siberia. His family was unusually large – he may have had as many as 16 brothers and sisters; the exact number is uncertain. His father was a teacher and graduate of Saint Petersburg’s Main Pedagogical Institute – a teacher training institution. Dmitri’s mother re-opened a glass factory which had originally been started by his father and then closed. She did this after her Dmitri’s father went blind. Dmitri’s father died when Dmitri was just 13. The glass factory burned down when he was 15. At age 16, Dmitri moved to Saint Petersburg, which was then Russia’s capital city. He won a place at his father’s old college, in part because the head of the college had known his father. He trained there to be a teacher. By the time he was 20, Dmitri Mendeleev was publishing original research papers. Crippled at times by tuberculosis, he often worked from bed. He graduated as the top student in his year, despite the fact that his uncontrollable temper had made him unpopular with some of his teachers and fellow students. In 1855, aged 21, he got a job teaching science in Simferopol, Crimea, but soon returned to St. Petersburg. There he studied for a master’s degree in chemistry at the University of St. Petersburg. He was awarded his degree in 1856. 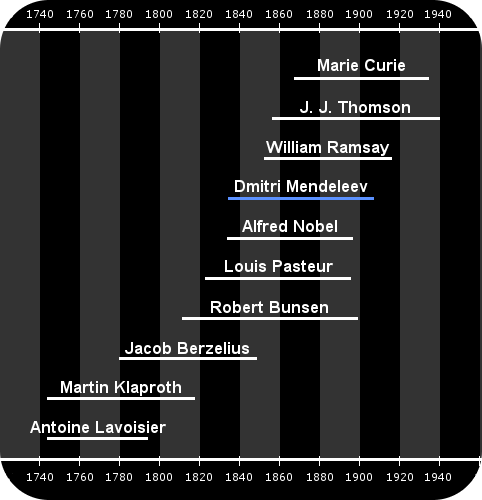 Dmitri Mendeleev’s lifetime and the lifetimes of related scientists. Mendeleev had trained as both a teacher and an academic chemist. He spent time working as both before he won an award to go to Western Europe to pursue chemical research. He spent most of the years 1859 and 1860 in Heidelberg, Germany, where he had the good fortune to work for a short time with Robert Bunsen at Heidelberg University. In 1860, Bunsen and his colleague Gustav Kirchhoff discovered the element cesium using chemical spectroscopy – a new method they had developed, which Bunsen introduced Mendeleev to. In 1860, Mendeleev attended the first ever international chemistry conference, held in Karlsruhe, Germany. Much of the conference’s time was spent discussing the need to standardize chemistry. The conference played a key role in Mendeleev’s eventual development of the periodic table, producing an agreed, standardized method for determining atomic weights. Mendeleev’s periodic table was based on these standardized atomic weights. All gases, at the same volume, temperature and pressure, contain the same number of molecules. By the time he returned to Saint Petersburg in 1861 to teach at the Technical Institute, Mendeleev had become even more passionate about the science of chemistry. He was worried that Russia was trailing behind Germany in this field. He thought improved Russian language chemistry textbooks were a necessity, and he was determined to do something about it. Working like a demon, in just 61 days the 27 year old chemist poured out his knowledge in a 500 page textbook: Organic Chemistry. This book won the Domidov Prize and put Mendeleev at the forefront of Russian chemical education. Mendeleev was a charismatic teacher and lecturer and held a number of academic positions until, in 1867, aged just 33, he was awarded the Chair of General Chemistry at the University of Saint Petersburg. In this prestigious position he continued pushing to improve chemistry in Russia, publishing The Principles of Chemistry in 1869. Not only did this textbook prove popular in Russia, it was popular elsewhere too, appearing in English, French, and German translations. At this time, chemistry was a patchwork of observations and discoveries. Mendeleev was certain that better, more fundamental principles could be found. This was his mindset when, in 1869, he began writing a second volume of his book The Principles of Chemistry. At the heart of chemistry were its elements. What, wondered Mendeleev, could they reveal to him if he could find some way of organizing them logically? He wrote the names of the 65 known elements on cards, much like playing cards, one element on each card. He then wrote the fundamental properties of every element on its card, including atomic weight. He saw that atomic weight was important in some way – the behavior of the elements seemed to repeat as their atomic weights increased – but he could not see the pattern. Convinced that he was close to discovering something significant, Mendeleev moved the cards about for hour after hour until finally he fell asleep at his desk. It took him only two weeks to publish The Relation between the Properties and Atomic Weights of the Elements. The Periodic Table had been unleashed on the scientific world. Why was Mendeleev’s Periodic Table Successful? As with many discoveries in science, there is a time when a concept becomes ripe for discovery, and this was the case in 1869 with the periodic table. Lothar Meyer, for example, had proposed a rough periodic table in 1864 and by 1868 had devised one that was very similar to Mendeleev’s, but he did not publish it until 1870. Newlands also predicted the existence of a new element (germanium) based on a gap in his table. Unfortunately for Newlands, his work was largely ignored. Propose that some of the elements, whose behavior did not agree with his predictions, must have had their atomic weights measured incorrectly. Predict the existence of eight new elements. Mendeleev even predicted the properties these elements would have. It turned out that chemists had measured some atomic weights incorrectly. Mendeleev was right! Now scientists everywhere sat up and paid attention to his periodic table. And, as the new elements he had predicted were discovered, Mendeleev’s fame and scientific reputation were enhanced further. In 1905, the British Royal Society gave him its highest honor, the Copley Medal, and in the same year he was elected to the Royal Swedish Academy of Sciences. Element 101 is named Mendelevium in his honor. Dmitri Mendeleev died in Saint Petersburg, February 2, 1907, six days before his 73rd birthday. He was killed by influenza. "Dmitri Mendeleev." Famous Scientists. famousscientists.org. 1 Sep. 2014. Web.